← How dare you, King George! Mid-year seems like an appropriate time to check back with those sources for updates, to see what is driving those gears in the areas surrounding the Ozarks. The July 2, 2010 version of the St. Louis Federal Reserve Bank’s Burgundy Book indicates more of the same economic bad news in the first half of 2010, with reports on the St. Louis, Louisville, Memphis and Little Rock zones. In the St. Louis zone report, manufacturing employment continued to slide, while there was a little life in car sales and residential real estate, both of which had been boosted by federal programs. Commercial real estate was dead. Non-farm payrolls showed a slight increase in the second quarter (0.19% per month), but lagged the national monthly growth rate of 0.26%. As in 2009, the employment growth sectors were education, health and government; temporary federal Census jobs probably accounted for some of the meager growth. 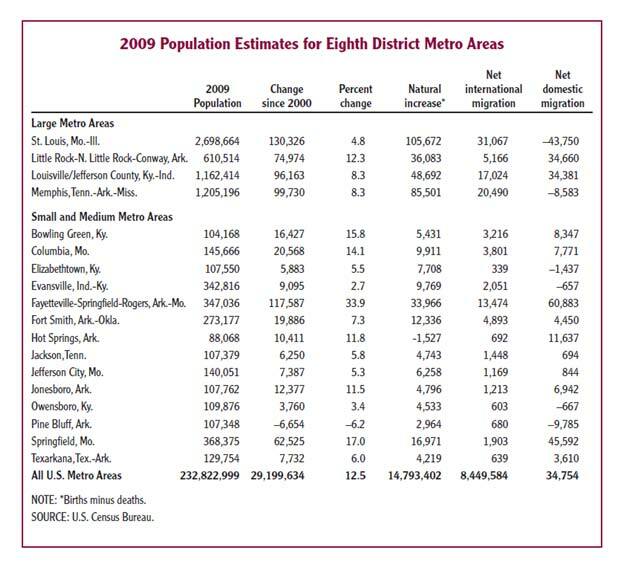 Within the St. Louis zone, the Springfield metro area had the highest rate of job growth from May 2009 through May 2010, losing 2.75% of its manufacturing jobs but gaining 1.64 % in service employment, for a total job growth of 1.14%. ﻿Note that in the entire region of the St. Louis Fed, the fastest-growth areas since 2000 have been in the Ozarks, with the Northwest Arkansas (NWA) and Springfield, Missouri, leading in growth rate. At the end of 2009, the Census estimated the populations of both areas to be similar. NWA’s remarkable rate of 33.9% in 10 years comes from a 33,966 natural increase (births in excess of deaths), 13,474 immigrants from outside the U. S. and 60,883 immigrants from inside the U. S. NWA’s total population growth of 117,587 was nearly twice Springfield’s. Springfield’s 17.0% growth came primarily from migration from inside the U. S., with only half the natural increase and one seventh of the number of immigrants outside the U. S. Obviously, NWA has a younger population with a higher birthrate than Springfield, and apparently more jobs for immigrants. Louisville and western Kentucky are experiencing some of the same problems as the St. Louis zone, but with a surge in non-farm payrolls in the second quarter of 2010, expanding at a 0.5% monthly rate, and an increase in residential building permits. The job growth in the past year has been strongest in professional and business services, with some growth in the education and health and government sectors. All areas in this zone continue to experience manufacturing job losses. Personal income growth in the Louisville and western Kentucky zone, unlike the St. Louis zone, has substantially exceeded the national average in the past year. The Memphis zone report showed job losses in every sector but government, where the slight growth was partially attributed to temporary Census workers. However, the zone report contains anecdotal signs of a rebound in manufacturing jobs and a major increase in residential building permits issued over the moribund level of 2009. The job picture in the Little Rock zone is dismal, with job losses of 4.0% or more in most sectors. Even government lost jobs, while there was a small amount of increase (2.4%) only in the education and health sector. While Oklahoma has not experienced the 9% to 10% unemployment rates of much of the region, job growth has stalled in Oklahoma. Like other energy-exporting states, Oklahoma’s state government and public education system depend heavily on severance tax revenues that are assessed on the production of oil and gas and other minerals. Oklahoma’s government is facing large revenue shortfalls due to the weak demand for oil and gas. Crude oil prices below $60 per barrel and natural gas prices at less than $5 per million BTUs do not encourage production within Oklahoma, though the active drilling rig count in Oklahoma increased by 52.4% from May 2009 to May 2010, when it hit 125. In the boom years of the late 1970s through 1982, the rig count was often several times the May 2010 figure. Oil production in Oklahoma has been falling for 30 years, though gas production has sometimes been strong. In addition, Oklahoma’s oil and gas service companies and manufacturers of oil and gas drilling, production and processing equipment earn dollars from outside the state, as well as helping to keep Oklahomans working. According to the Federal Reserve Bank in Kansas City, Oklahoma’s growth in non-farm employment from May 2009 to May 2010 has been limited to government, educational and health services, financial activities, and professional and business services. Residential real estate construction in Oklahoma did not experience the crazy growth rates from 2000 through 2007 as much of the rest of the country. However, the number of permits for new single-family construction has been declining in Oklahoma the first part of 2010, while other parts of the Midwest are seeing modest growth. Other types of construction, such as public works projects, have taken up some of the slack. The economies of Kansas and Kansas City, also in the 10th District of the Federal Reserve System, are geographically part of the Great Plains, with economies heavily based on cattle, grain production and processing, and energy. Just as the St. Louis and Louisville and Memphis economies are similar, so are the economies of Oklahoma, Kansas and Nebraska. Compared to their metro peers, rural economies are more dependent on manufacturing. The manufacturing section accounts for 12.1 and 18.2 percent of rural employment. I knew that much manufacturing moved to rural areas after World War II, to take advantage of a surplus labor supply and the absence of labor unions. Many towns in the Ozarks found themselves with garment factories and shoe factories. The growth of the interstate highway system encouraged truck-based distribution systems, at the expense of the railroads, which also favored dispersal of manufacturing and the population into rural areas. However, I had not considered that rural areas were relatively more dependent on manufacturing employment than metro areas. At the end, Henderson—apparently imitating agricultural economists—states that the rebound of rural areas in what is sure to be a jobless recovery “could hinge on the ability of rural business to harvest emerging opportunities.” Well, we all knew that. Regional prosperity comes from exports of goods and services in excess of the payments for goods and services the region pays out. There are many flows in and out of goods, services and money. Many of those moving to the Ozarks are retirees, who bring their pensions and savings earned elsewhere, which they spend on housing, medical care and other ordinary expenses. Tourists in the Ozarks pay for entertainment and recreation. But creation of good-paying jobs is difficult, due to competition with regions that have highly-skilled labor forces. NWA and the Springfield area have some outstanding producers of income for the Ozarks (Walmart, Tyson Foods, O’Reilly Automotive, BKD, University of Arkansas, Missouri State University, and many medical facilities), but the more rural areas of the Ozarks struggle with loss of manufacturing jobs and low-wage and seasonal employment. In many Ozarks counties, state and local government jobs are just about the only jobs with health insurance and retirement programs. Local governments attempt to manage their revenue shortfalls without laying off employees. This is an election year, and layoffs would probably add to the anti-incumbent fervor. What good is a local elected official if he or she can’t employ their loyal supporters? Jason Henderson, with his colleague Alison Felix, has also written about the effect on rural America of the fiscal crisis being faced by state and local governments. It’s worth reading, if you want to understand how important local government employment is to the economies of the Ozarks, especially at a time when the gears in the economies of the surrounding metro areas are turning so slowly. I’m tempted, after reading this, to conclude that the object to seeking county office is to gain influence over who gets county jobs and contracts. Posted in Arkansas, Branson, economic development, Missouri economy, Ozarks, Ozarks economy. Bookmark the permalink. Service employment is the vast majority of jobs in this town. Even if the number goes up, the tax base goes down because the buying power is going down.